1) how much does very closely spaced quilting obscure the fabric design? And..
3) how labor intensive a process is this? Better to test this out on a small project, before committing to the whole shebang, right? So I sewed together two great fabrics, layered them into a sandwich with batting and backing and created a test panel, which will be used for something fun at a later time. I began by quilting straight lines every 1/2 inch. Next I went back and filled them in more and more with lines that were 1/4, 1/8, and finally about 1/16th of an inch apart. That is Uber matchstick quilting, I know, but the whole purpose for doing it was to see how far I could take it and at what points it would be most useful for different kinds of projects. 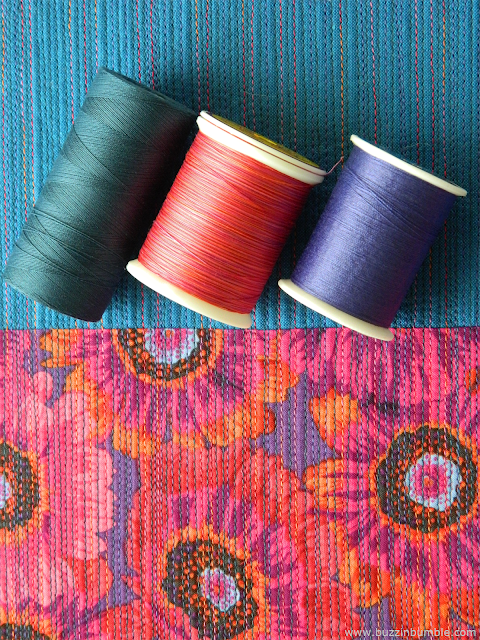 Did you ever give matchstick quilting a try? Does it take you a freakishly long time to fill it all in? It did for me. But... it is a fun, almost meditative kind of sewing and very relaxing to do. Strange partners - Connecting threads, King Tut, and 25 year old Dual Duty. The first thing I learned was a surprise: Even super closely spaced matchstick quilting does not hide the design of the fabric as much as I thought it would. In fact, the closer the stitched lines got, the less disruptive they seemed. Look at the photos and you can still see Philip Jacobs' Painted Daisies in all their colorful brilliance. (The pictures show better detail if you click to enlarge them) In fact by, switching thread colors a few times, the stitching adds a wonderful effect to the fabric design. I even used a King Tut variegated thread in there. What fun that is to see it travel over colors and draw them out into the background of the design! The Peppered Cotton quilted up great this way too. The second thing I learned was just what you would expect: The closer your stitching lines get, the stiffer and thinner the quilted piece becomes. This is great for some purposes, but would not make for a very cuddly quilt. It became too stiff to be useful for Sam's quilt at the point where the sewing lines were less than 1/4" apart. The quilting spaced like you see it in the above photos would be great on a wall quilt or on a bag, table topper, or a decorative pillow though. So I am still undecided on how to quilt Sam's quilt. If you have any suggestions for quilting that would go with a clean lined modern quilt and still be within the grasp of a quilting beginner, I'd love to hear them. (You can see the EQ Mockup of "Serenity Now!" here.) I am still pondering doing matchstick quilting, but sewing it far enough apart that it would be more akin to go-fetch-stick quilting. I'm also considering wavy organic quilting lines like Lorna does (Sew Fresh Quilts). Just look at Lorna's closeups in photos 5 and 6 of that post and you will see why I love that. Would you like to see something else fun that you can do with matchstick quilting? Kitty (Night Quilter) just posted a great example of matchstick quilting with the use of negative space to create letters in relief. In her Terrific Tutorial, Kitty explains a clever trick she uses to avoid the problem of all those little stops and starts around the letters. Our crabapple trees were in full bloom last week and I thought you might enjoy seeing them. We planted this variety because the trees hold onto their red little apples right through the winter and into early spring, which makes a pretty sight with the snow as a backdrop. They put on a beautiful show in springtime too, and cover themselves in pink buds which open up into rosy centered white flowers. Yes, I've done Lorna's style of wavy line quilting before. Its so easy to do and I love the effect :-) Your matchstick quilting is so beautiful.I love it! Thank you for sharing your matchstick quilting experiment. I agree it would look lovely for quilted items you don't plan to snuggle under. It was funny: when you asked for alternate suggestions for Sam's quilt, I thought of Lorna's wavy lines, and when I read a little further you suggested them yourself! I'll stay tuned to see what quilting you settle on. Your crabapple show is lovely. Spring has definitely sprung! What a great way to experiment with a new quilting idea. I love the look of the matchstick quilting, although from your review above I could see how it wouldn't be perfect for every project. Lara, your matchstick quilting is beautiful, especially with the different threads! I'm going to have to remember that for a SMALL project. I,too, was thinking of the wavy quilting before you mentioned it yourself. I like the movement of the wavy quilting. Can't wait to see what you decide to do! You know... I have not done any straight line matchstick quilting before.... But have done closely spaced wavy line quilting. I agree that the matchstick quilting turned out really beautifully. And would be great on a table topper or set of place mats. 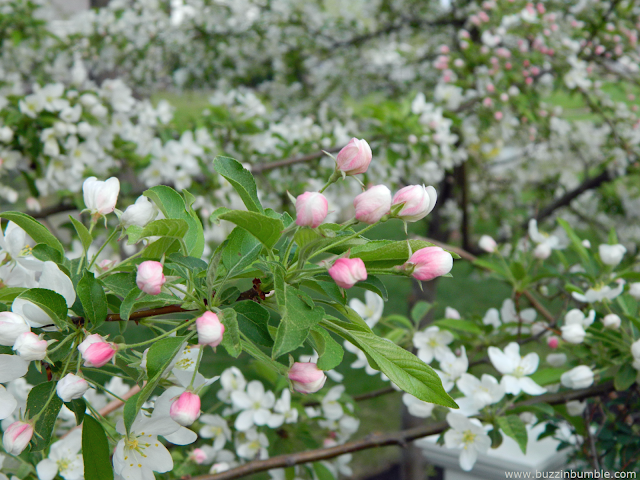 Thanks so much for sharing photos of your apple trees. Those pretty blossoms are a breath of fresh air and make me smile! It probably helped that I was unaware it could be a problem, LOL. Well now that you have me thinking about it, I bet these were the factors that helped keep a straight seam: the seam was ironed open, (so less of a bump there), the quilt sandwich is held together with spray basting, and I started with lines 1/2 inch apart and then filed them in. I love how you always get me thinking about things more Yvonne! That is some gorgeous quilting! I love how it turned out. I've never gone all the way to matchstick... I think the closest I've ever come is ¼ inch apart or maybe a little less. That piece would be awesome sewn up as a boxy tote or zipper pouch. Then you'd get to admire that lovely quilting on an every day basis (or give it as a gift)! This really turned out cool - especially with the different color threads. I had not heard of this before - or just didn't know the name. And hadn't considered it so thanks for the taking the time to share. I know I'll use it sometime on some quilt. Whatever project you make with this will be so beautiful. As for your son's quilt, the wavy lines would look good. My only other idea is to quilt 1/4 inch from the seams (the ditch) around all those triangles to accent all the triangles. Maybe you could criss-cross the quilting so you don't have to stop and start all the time. Great experiment Lara. I tried matchstick (1/4" apart) for the first time on a table runner the other day. I enjoyed how it looked for that project. I would worry about an entire quilt getting too stiff. 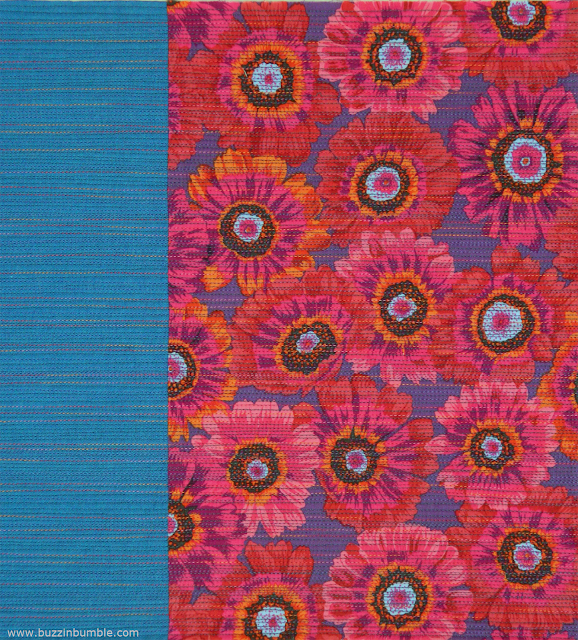 What if you did matchstick in either the dark or neutral side of each diamond of Sam's quilt? The other thing that would look cool would be to echo and off-set the diamond across the row. It would look like the same geometric shape repeating in just the quilting. I always like how matchstick quilting looks but it's definitely not for a quilt meant for snuggling up in. On the other hand your sample is gorgeous; you should definitely revisit this in some shape or form. Love the spring pictures - we've gone back to freezing here so they really cheered up the afternoon. I immediately thought wavy lines when I looked at the quilt. It would give a contrast to the stark lines of the diamond grid of the quilt. The matchstick quilting can cause some distortion over the entire quilt.....ask me how I know. Second option would be the diagonal grid as Skootchover suggests. An interesting experiment Lara - I really love the effect you have gained with the uber work - down to the use of different coloured threads. I've done a little on a cushion - I really liked it but it did take me a while! I love your Matchstick Quilting Exploration ! My favorite matchstick quilting is when quilting on the solid fabric. I know that I would not be patient enough to make anything bigger than a block size with Matchstick quilting. I have learned a lot from you post,Lara! I did matchstick quilting, about 1/16", on a pocket (inside, like DUH, no one ever sees it but me) for an Amy Butler bag I made last winter. It took SO LONG--really shocked me as to just how long. I love the effect, and it is great for the pocket. I love the threadplay in the blue, and yes! it is amazing, truly amazing, how it does not detract from the gorgeous floral. I'd love to see a bustier done like this, for a costume, or for when I get my Outlander or Once Upon a Time on, you know, lol. As for Sam's quilt, you probably know what I will suggest: dot to dot quilting. If you do a few lines, and then fill in only every second one or so, you get some AMAZING textures. Skinny figure 8's are pretty easy, as is ribbon candy for fills. Love your crabapple tree; there are so many around us down here that I have no clue what they are, and I wish I did! So thank you for telling us what your beauty is. I learned today, two more that I've not seen in Alberta, but they are prolific here: Beauty Bush and Snowball Spirea. 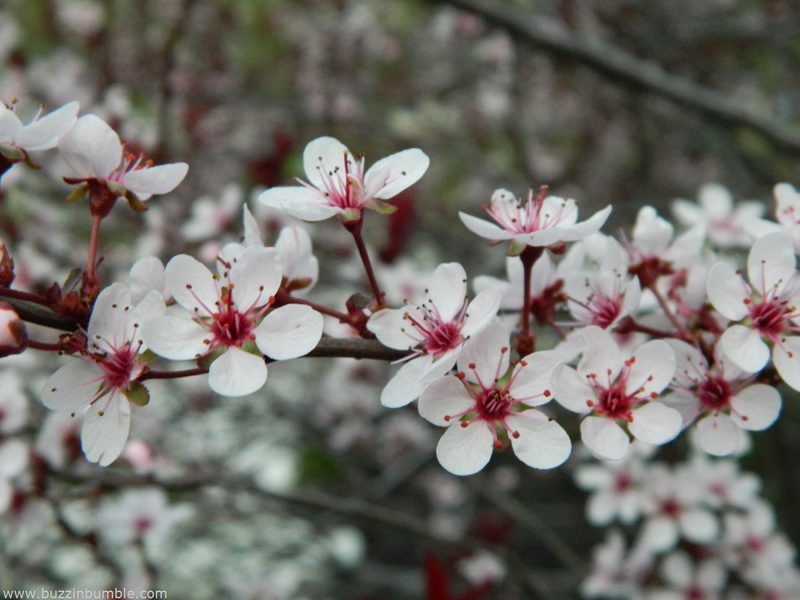 Love how many quilters post pics of spring blossoms! :-) We love Mother Nature's palette! Thanks for sharing your experience. Very informative. Love seeing your quilting. And I'm still chuckling about your go-fetch-stick quilting. :D I like the idea of wavy organic if you want to use the walking foot, but I also like the idea of wiggly lines back and forth or what Sandra suggested. What a rich and informative post Lara! You are very right to test quilting on a small project. By being too optimistic I had some surprises such as quilts too stiff and too thin. That's why I come back to hand quilting. But your matchstick quilting looks great, and I learnt a new word! Great post. I love the color variations of your thread. And the fabrics! Yum. I quilted lines near 1/4" on a recent top. Like you, I was surprised how long it took. The result was not completely cuddly, but very drapeable. Remember to wash this sample. Many of mine seem stiff until they are washed the first time. Then they soften right up. What batting did you use? I prefer thin batts like Mountain Mist. I've done matchstick like Kitty did, sewing small sections into submission while letting others pop. I think the wavy lines will soften the straight lines of the quilt, but that quilt is so beautifully graphic I don't think I'd do it. For me I'd stitch in the ditch around all of the triangles, then do a simple echo, no less than 1/4 inch to emphasize the shapes and keep it soft. Easy and simple, but that quilt is gorgeous on it's own. How about in the ditch vertical but horizontal lines as the feature? Would that clash with the up down nature of the quilt? I love the alternating thread colors on your matchstick experiment... that is going to be very nice in some future project. For the quilt though... I wonder what it would look like if you just echoed the lines of the quilt to create diamonds with the quilting. Hi Robyn, thank you for sharing your thoughts on this! A few others liked slight variations of this idea and I do too. It seems like it would go very well with the design of the quilt. Did you know that you are a no-reply commenter? That is why I am replying here. Hope you come back to visit and see this note! Thank you so much for sharing your experiment with matchstick quilting. I've never tried it, but I love the look, and now I know what kinds of things it might or might not work for. It is amazing that it does not hide the print, but at the same time makes a more solid fabric richer. As soon as I started reading your paragraph about your indecision with Sam's quilt, Lorna's name popped into my head. I'm really taken with the organic, wavy lines she quilts. So I think you are onto something there. It will be fun to see what you decide. Everyone has such neat ideas. Your crabapple trees are beautiful! Sorry I can't help with the quilting decisions since I have done minimal machine quilting, just enough to decide it isn't for me. I agree, though, that very close quilting is not very cuddly. Your matchstick quilting experiment sure adds an interesting dimension, and I imagine texture to a quilted piece. Neat how the threads just blend into the fabric and seem to become part of it. I've only done straight-line quilting about 5/8 to 3/4 inches apart, but I liked the effect and would do it again. Pretty flowering crab! I love the effect the matchstick has on your sample. I've never done it myself but I do like the idea of using different color threads. I have done the wavy, organic quilting a couple of times. I think mine looked better when it was a bit closer together. but I did have some problems with the fabric pulling. It almost turns it into a new fiber with all of the quilting. I love densely quilted quilts! Love matchstick quilting and I also love organic waves. I would choose the latter for a softer bed quilt and the former for a wall quilt or mug rug. I'm not patient enough to do it on quilt so I use it on mug rugs which are great if they are a bit stiff, lol. I do love the look of match stitch quilting, but I agree that it takes forever. I reserve it for smaller wall hanging quilts.